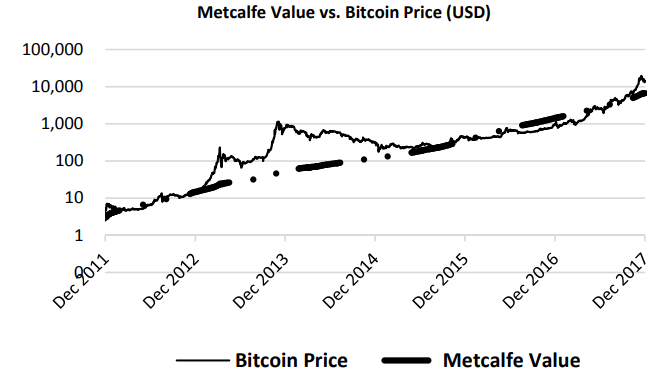 Bitcoin’s value is really a moving target at this infancy stage of development. There are all sorts of approaches, all with their merits and shortcomings. Essentially, this model takes 3 data sets: 1) number of wallets and 2) number of bitcoins created. 3) Number of transactions. The model takes number of 1) wallets and 2) bitcoins as an initial base, and number of transactions as a multiplier (kind of like velocity of money supply) to come to a price. The authors ran some regressions with actual price, and showed that price can be significantly explained by the size of the network. And we see that bitcoin can have a lot of noise for a long period of time. Remember Amara’s Law: "We tend to overestimate the effect of a technology in the short run and underestimate the effect in the long run." In my opinion, the use of the number of wallets instead of number of nodes inflates the estimated value. Wallets are so easy to create, and we know by now that many wallets are zombie wallets - maybe because someone forgot the private key, or just hodling. Still this is a critical data set to assess the network. I think the number of nodes is a better assessment of the bitcoin network because running a node is more involving (nodes include miners). Furthermore, it is the number of nodes/miners that secure the system, not wallets. So I believe a better model would include number of nodes as a key data set. The recent hype started in 2017. There was a run up to $1200 to start the year, but it consolidated around $1000 for a few months. We can say this was the “fair” price at the time, though some can argue $800 was more sticky at the end of 2016 before the run up - so we will use both prices. Overlay of network size on top of price chart. Meanwhile, price was at $1000 at the start of 2017. But if we use $800 as the “fair” price at the start of 2017, the current “value” would be around $1600. Price is around $4300 during the 11/29 session. BTC is in a bear market this year relative to the hype of 2017, so I think there is definitely going to be more downside pressure towards those “fair value” estimates. It should be noted that the number of nodes plateaued during the height of the mania, which makes sense. Then, when price came down nodes started going offline i.e. miners quitting. The interesting thing is, the number of nodes rebounded a bit before the recent price dip. Will this new trend sustain and eventually help price find a bottom? Or will the latest crypto bloodbath activate another round of node-quitting? I was recently at a bitdevs meetup in NYC, and saw many Lightning payment channel demos. Quicker transactions and low fees are coming folks! This will create another set of networks that are like branches of the blockchain. The number of and activity on lightning nodes will have to be folded in the assessment of bitcoin’s network size/strength. Because we did not consider the arrival of Lightning on the BTC network, we can argue that our estimate in the $1600-$2000 zone is relatively low. Whether you believe price has anything to do with the network, it is still important to acknowledge that the size and activities of the network are what makes bitcoin secure, immutable, and all the good stuff envisioned in Satoshi’s whitepaper. If we value these features, Bitcoin will be worth more if the network is larger/stronger.